Ryukokudai Heian players take the field for practice Monday at Koshien Stadium. 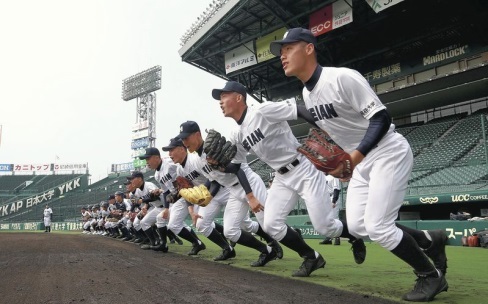 The Yomiuri Shimbun NISHINOMIYA, Hyogo — Defending champion Ryukokudai Heian was the first team to take the field at Koshien Stadium for practice Monday in preparation for the upcoming National High School Baseball Invitational Tournament. Whether the Kyoto school can again be around at the end of the 32-school tournament will be determined in the two weeks after play starts Saturday. The remainder of the teams then followed with 30-minute practice sessions each. Ryukokudai Heian is involved in one of the more intriguing first-round match-ups, as the school has been drawn to face Saitama’s Urawa Gakuin, the 2013 champion.